Anything Sews is led by Lou Burns and Barb Van Buren. For more information or to be added to the AS NG Member email list please contact them. Meetings are on the 3rd Saturday of every month from 09:30 until 3:30 (or until the last person leaves!). Bring your machine and project supplies and join us in the back classroom of Sew Worth It located at 5507 Palmer Crossing Circle (Corner of Clark & Honore) in Sarasota. Bring a bag lunch and beverage to all meetings! Our 2019 community service project is sewing quilts for veterans. May 18- Quilt blocks led by Jann. 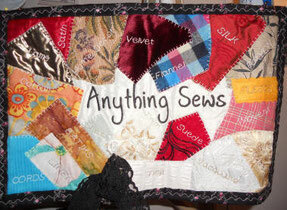 Three quilt block patterns to accommodate different sewing levels will be made available to participants. The will be used to assemble lap quilts for veterans. Jun 22- Assembly of Veteran lap quilts.